Have you the last Version 4.12.02-E dated 10/12/2018 ? I get message that the files are not safe and are therefore deleted by my antivirus. How can I get good files? !! Attention release 4.x.x !! - Send me the new software code using copy and paste (NO screenshot ), I send back a FREE key. - When you run for the first time go the View menu, select Template defaults, in the frame Units, you can choose English unit (inches). You must restart TraCFoil after the units modification. I suppose that TraCFoil is already installed on the PC, otherwise see below. - After a fresh install on a new PC, TraCFoil generates a new Software Code, just ask me by sending me the new code by copy-paste (NO screenshot) and version number generated by TraCFoil. I send back a FREE key. 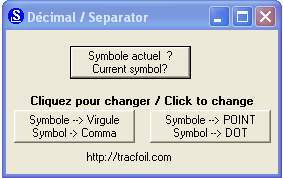 - After formatting or change the hard drive, the TraCFoil generates a new code, just copy the file tracfoil.lic generated by TraCFoil at the first install. Otherwise, ask for a new key by sending me the new Software Code by copy-paste (the code should look like 45DF89A76A5F7D2D_TF_4.12.02-E NO screenshot) and version number generated by TraCFoil. I send back a FREE key. - Send me the Software Code by copy -paste (the code should look like 45DF89A76A5F7D2D_TF_4.12.02-E NO screenshot) ask for a new key, and I give a FREE new key. Just send me the Software Code by copy and paste (the code should look like 45DF89A76A5F7D2D_TF_4.12.02-E NO screenshot) of new PCs, indicating the version number, and I give a free new key. All the registred users received a mail when there is a new major update. Updates to TraCFoil are free and are posted on web site in the form of an update file, majtracfoilE.exe. The link to download this file is on the mail registration send with the code. With a PC connected to Internet, go to the download page, download the trial version ctrafoilE.exe and "Free Pack Airfoils"(airfoils). Then copy the files on a USB key or on a CD and make an installation on the PC not connected to the internet, then send me the Software Code (copy -paste NO screenshot) ask for a new key. Files or programs to download are checked for viruses before being placed on the server. Beware of false positive some antivirus. Go to this menu ? (Help) and Registration : Copy the Software Code, NO screenshot, and the version number of your dialog box "Please register"